Nothing seems to have the same impact as being able to tell a clear story of how something we have done ultimately saved a life or prevented a tragedy. I continue to be impressed by not only stories about our program successes, but about their impact on people’s lives. We do have a very powerful story to tell, and I try to take every opportunity to share those stories with leaders here in Washington and around the country. One thing that we use to tell that story is all the information that you send to us throughout the year. Whether it is data on implementing countermeasures or alerts on new highway safety legislation in your States, it all helps us communicate the success of our programs. Other examples are the annual HSIP reports that document the HSIP accomplishments in each state. We have tapped into those reports for examples of systemic safety improvements, broad implementation of countermeasures, and integration of safety in major roadway improvements. I want to thank all of you who have put the effort into making that report a useful tool for us, and hopefully yourselves. However, there is still room for improvement in many States and as you can see the information is being used! Another tool that will help us “tell the story,” is the Highway Safety Manual (HSM). The HSM gives us the opportunity for the first time to be able to quantify the safety impacts of our actions. Having this analytical tool will not only improve safety decision-making in State and local governments, but will allow us to look at the safety implications of different program investments. In an era of constrained resources, it is imperative that we be able to show the American public the return they should expect from these programs. I am confident that the improvements we are implementing are in fact making a real difference. Recently, I was speaking to a group of industry executives and noted our emphasis on the Safety Edge, particularly the effect it could have in preventing crossover head-on collisions. One of the executives told me that just two weeks ago a close friend of his had died in exactly this kind of crash after trying to recover from a pavement edge drop-off. Safety Edge might have been enough to thwart that tragedy. It is stories like this that we hear every day. It is stories like this that continue to provide testimony to the importance of what you do. The Safety Edgeis one of five innovative technologies selected for accelerated deployment under the Administrator’s Every Day Counts - Accelerating Technology & Innovation Deployment Initiative.FHWA will promote the installation of Safety Edge as standard practice on paving projects. Using a commercially available shoe to confine hot asphalt into the safety edge shape as it is placed, provides an edge that holds the pavement together longer. As with conventional paving, the safety shaped edge should be covered as the unpaved shoulder is brought flush with the top of the pavement. The safety edge shape works on concrete pavements as well. Over time, as the edge is exposed due to erosion or settling of the unpaved shoulder, the safety edge shape may save lives as drivers who drop a tire off the pavement or otherwise leave the paved surface are able to safely regain the roadway rather than lose control of their vehicle due to a vertical edge drop-off. 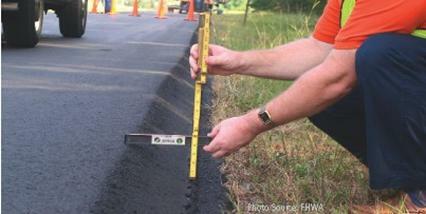 For more about the Safety Edge, visit http://safety.fhwa.dot.gov/roadway_dept/pavement/safedge/ and the Fall Issue of the FHWA Safety Compass. Potential for reduced crash frequency and severity in a jurisdiction’s transportation system as a whole. Cost savings in the overall operation of the system as well as the planning, design, and construction of projects. Many of the methods in the HSM can compensate for the variability of crash data to provide more stable and reliable results. These results can lead to more effective planning for safety investment. Analysis tools for predicting the impact of these decisions on road safety can lead to more efficient investments. Provides opportunities to realize cost savings during project development, operations, and maintenance activities. Decisions can be made based on quantitative evaluations that predict changes in crash frequency based on the type of treatments used, instilling confidence that safety funds are being applied most effectively. The tools in the HSM make it possible to integrate safety analysis into the project development process in the most cost-effective manner. Prior to this first edition of the Highway Safety Manual (HSM), transportation professionals did not have a recognized national resource for quantitative information on crash frequency prediction. As a result, safety considerations often carried little weight in the project development process, limiting the ability of transportation professionals to discuss and act upon safety-focused recommendations during project development. An effective resource was urgently needed to quantify and predict the expected crash frequency of elements considered in road planning, design, construction, operation, and maintenance. The HSM begins to fill this gap, providing transportation professionals with a set of proven analysis tools for crash frequency prediction to encourage explicit consideration of the safety-related effects of transportation decisions. HSM provides current knowledge, techniques and methodologies to quantify safety impacts – similar to the way operational impacts are quantified in the Highway Capacity Manual, and environmental impacts through the NEPA process. The HSM provides the best factual information and tools in a useful form to facilitate roadway decisions based on explicit consideration of the effects of these decisions on potential future crash frequency and severity. Part A describes the purpose and scope of the HSM, explaining the relationship of the HSM to planning, design, operations, and maintenance activities. Part A also includes fundamentals of the processes and tools described in the HSM. A chapter based on fundamentals provides background information needed to apply the predictive method, crash modification factors, and evaluation methods provided in Parts B, C, and D of the HSM. Part B presents suggested steps to monitor and reduce crash frequency and severity on existing roadway networks. It includes methods useful for identifying improvement sites, diagnosis, countermeasure selection, economic appraisal, project prioritization, and effectiveness evaluation. The chapters in Part B discuss the network screening process, diagnosis, selection of countermeasures, project prioritization, and safety effectiveness evaluation. Part C describes the predictive method for estimating expected average crash frequency of a network, facility or individual site. Part C can also be used as a source for safety performance functions (SPFs). SPFs estimate crash frequency as a function of traffic volume and roadway characteristics. The chapters in Part C provide the predictive method for segments and intersections for rural two-lane roads, rural multilane highways, and urban and suburban arterials. Part D provides a catalog of crash modification factors (CMFs), which represent the change in crash frequency due to a particular treatment, for the purpose of potential crash frequency reduction. CMFs are used to estimate the change in the expected average crash frequency plus or minus the standard error provided with the CMF. Treatments are provided for roadway segments, intersections, interchanges, special facilities, and road networks. Software Support. The Highway Safety Manual methodologies will be supported by the following software programs. SafetyAnalyst provides a set of software tools used by state and local highway agencies for highway safety management. SafetyAnalyst is applicable to Part B of the HSM. The SafetyAnalyst software is available through AASHTO, and additional information can be found at www.safetyanalyst.org. The Interactive Highway Safety Design Model (IHSDM) is a suite of software analysis tools for evaluating the safety and operational effects of geometric design decisions on highways. The IHSDM Website summarizes the capabilities and applications of the evaluation modules and provides a library of the research reports documenting their development. Information on the IHSDM is available at www.tfhrc.gov/safety/ihsdm/ihsdm.htm. The Crash Modification Factors Clearinghouse houses a web-based database of CMFs along with supporting documentation to help transportation engineers identify the most appropriate countermeasure for their safety needs. Using this site at www.cmfclearinghouse.org, users are able to search on CMFs or submit their own CMFs to be included in the clearinghouse. The HSM is now on sale at http://bookstore.transportation.org. Search under code HSM-1. Cost: $325 for AASHTO members. $390 for non-members. Discounts are available for those states taking HSM training. To find out more about the Highway Safety Manual, visit the HSM Website at www.highwaysafetymanual.org and/or http://safety.fhwa.dot.gov/hsm; or call Esther Strawder at 202-366-6836. The New Jersey Department of Transportation’s (NJDOT) Road Safety Audit Program uses Safety Impact Teams (SITs) to implement its program. SITs were created as a result of a statewide initiative called Safety First, signed into law in July 2003, which established the NJDOT’s Safe Corridor Program. A Safe Corridor (SC) is defined as a portion of a state highway that has experienced a higher than average number of crashes as compared to similar type roadways. In addition, fatal crashes and severity of crashes were also used as criteria for designation as an SC. New Jersey currently has 140 miles of designated SCs. Fines for most motor vehicle violations are doubled within the corridor, with the fines placed in the Highway Safety Fund and returned to the municipalities on a yearly basis. Not only was it important to identify those areas of state highway that experience an above average number of crashes, but evaluating solutions to those crashes was equally if not more important. The Process. The NJDOT, in conjunction with NJ’s FHWA Division Office, developed the Safety Impact Team process; a 3-day event that evaluates and recommends potential solutions to a Safe Corridor crash challenge. This process brings together a multi-disciplinary team of safety partners to provide a broad perspective of potential solutions to each corridor. The first item of a SIT is to assemble the Team members who will participate in the event. Team members are selected with an eye to diversity and to bring as many different perspectives on travel within the selected corridor. Besides DOT members from Traffic Engineering, Safety, Pedestrian and Bicycle, and Maintenance Operations, external stakeholders such as State and Local Law Enforcement, FHWA, Governor’s Representative from Highway Safety, Metropolitan Planning Organizations, Local Businesses, Local Citizens, Elected Officials, NHTSA, Transit, Media, AAA, AARP, and University members have been active participants. The first day of a SIT is a review of the corridor (10 miles) and includes relevant data such as crash summaries of injuries, fatalities, and property damage and crash rates; traffic volume; pavement condition rating; signal timings; roadway geometry; on-going or future construction and/or maintenance activity; and future development of the area. Team members have the opportunity to become acquainted with the area and ask relevant questions of the other members about the corridor. The second day of the SIT is a field day where members physically review the corridor. Team members are driven through the 10-mile segment, stopping at relevant locations to observe motorists, pedestrians, transit buses and riders (if applicable), and travel activities in general. Members are asked to provide observations and recommendations about travel and operational activities at those locations. All thoughts and potential solutions are recorded for further consideration. Day 3 of the SIT gives the Team members the opportunity to review all the recommended improvements recorded from the second day. The recommendations are further refined during this time to determine feasibility, time frame (short, medium, long term), responsible party, and a general cost estimate (low, medium, high). Short term improvements are defined as those that can be implemented within nine months and at a cost of under $500,000; medium term improvements under two years and under $2,000,000; and long term improvements over two years and $2,000,000. A full report of SIT activities and a matrix of recommendations are then sent to each Team member within 45 days, with implementation of the solutions by each respective agency. Results. Results vary for each individual corridor, but in general, recent results from the implementation of short term solutions has shown a reduction of crashes of 9%, 22% reduction in injuries, and a 30% reduction in fatalities. Challenges. One of the challenges with the SITs are that solutions have a tendency to be mainly focused on engineering improvements, such as signing, signalization, and pavement marking improvements, leaving out any of the potential enforcement and education components. In an effort to facilitate incorporating other non-engineering solutions, the NJDOT added a Safe Corridor Coordinator (SCC). The SCC is a member of the New Jersey State Police (NJSP) whose responsibility is to be a liaison between the DOT and the municipalities with a safe corridor. The SCC regularly visits the corridors and local law enforcement officials to discuss enforcement activities in the corridors and share best practices and lessons learned. In addition, the NJDOT expanded usage of the Highway Safety Fund monies to include educational safety campaigns and programs within the corridor, in an effort to implement educational solutions from the SITs. Other Applications. The SIT process has been used in other applications besides the Safe Corridors. The NJDOT piloted a Senior Safety Program, with three locations identified as having above average senior driver and pedestrian crashes. The SIT process was utilized to identify and implement solutions relevant to the senior population. Seniors volunteered and were active participants in the three day SIT event. In addition, the SIT process is used to evaluate the corridors identified in the Pedestrian Safe Corridor Program. These corridors are two to four miles in length and are noted for their high incidence of pedestrian and bicycle activity and crash pattern. Final Word. Based on the results, the NJDOT is confident that the Safe Corridor Program and the Safety Impact Team process has been successful in fulfilling the mission of reducing crashes and saving lives on New Jersey’s roadways. The NJDOT looks forward to continued utilization of this process. Delaware has reduced its fatal crash rate by 17% since 2003 through the implementation of effective crash countermeasures. During 2009 on Delaware’s roadways, there were a total of 18,927 crashes, including 102 fatal crashes, resulting in 118 fatalities and a fatal crash rate of 1.36 crashes per million vehicle miles traveled (MVMT). This crash rate has decreased over the last few years from 1.64 crashes/MVMT in 2003 to 1.36 crashes/MVMT in 2009 as a result of many factors including a decline in vehicle miles traveled and the implementation of effective crash countermeasures. In addition, DelDOT is in the process of implementing the SAFETY EDGE pavement drop-off countermeasure into its paving projects on a statewide basis. This article will discuss some of the successes that have been experienced in Delaware with these safety countermeasures. Centerline Rumble Strips. A recurring head-on crash problem existed on the US Route 301 corridor between the Town of Middletown, Delaware and the intersection with DE Route 896. In the early 90’s six fatal head-on crashes, resulting in nine fatalities occurred on this stretch of highway. 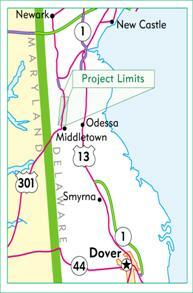 To mitigate these crashes, DelDOT installed milled centerline rumble strips and the installation was completed in 1994. A before and after study, covering crash data between 1991 and 2002 was conducted after the installation of the centerline rumble strips. The study indicated the number of head-on crashes decreased by 95% between the before and after periods and during the after period, no fatal head-on crashes occurred. Since 2002, only one fatal head-on crash has occurred on this stretch of roadway. 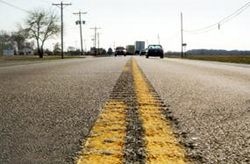 Due to the success of the centerline rumble strips, DelDOT has since extended the installation of centerline rumble strips along US Route 301 from Middletown to the DE/MD state line. Median Barriers. 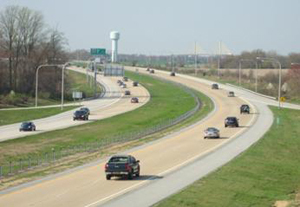 Within the last ten years, DelDOT has been undertaking an initiative to reduce the number of median crossover crashes on its freeway and expressway systems, including the Interstate system. The first of many projects occurred on Interstate 495, which serves as a bypass of Interstate 95 around the City of Wilmington. This stretch of freeway had the highest number of median crossover crashes. The roadway primarily consists of medians that are 40 feet or less in width. Over a few years, the Department closed these medians with double-faced w-beam guardrail. As part of our review of the median crossover crashes, the Department also focused on the freeway portion of DE Route 1. Between 2004 and 2007, there were two fatal crashes as a result of median crossover crashes on the stretch between SR 896 and SR 299, south of the C&D Canal. This section of roadway is approximately 5 miles in length and consists of two twelve-foot wide lanes in the northbound and southbound directions separated by a 66-foot wide grass median, which has very flat side slopes. A study was undertaken and it was determined that median guardrail was warranted based on the crash history. 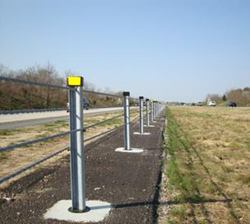 Due to the width of the median, the Department decided to use a high-tension cable guardrail system, instead of traditional w-beam steel guardrail. Our reviews of the high-tension system showed that the installation costs were lower than that of traditional guardrail. Additionally, due to the ease of maintenance, DelDOT’s maintenance forces could maintain the system instead of having to rely on an on-call maintenance contractor to handle repairs of the system. The project started in late fall 2009 and was completed in February 2010 for a total cost of $748,677.69. To date there have been several crashes on the system; however, there have been no median crossover crashes. Over the last few years, Delaware has seen increases in the number of pedestrians involved in fatal crashes. We have been working diligently to counteract these occurrences by improving pedestrian safety statewide. DelDOT has begun installing pedestrian countdown signal indications on all new and retrofit traffic signal improvement projects. To date, there are over 100 intersections within the State of Delaware that have countdown pedestrian signal indications. In addition to the countdown indications, the Department formalized a policy for the installation of Accessible Pedestrian Signals (APS). 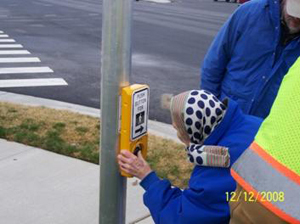 Installation of these systems, for visually impaired pedestrians, is based on a prioritization system as well as available funding. To date, there are five intersections statewide that have APS operational and another twelve that are in various stages of design or implementation. Finally, among other corridor wide pedestrian safety initiatives, we will soon be installing our first HAWK pedestrian hybrid traffic signal. The HAWK is a type of pedestrian hybrid traffic signal that can be installed at an unsignalized location to assist pedestrians in crossing a street or highway at a marked crosswalk. Through a collaborative effort with the University of Delaware, the HAWK signal will be installed on DE Route 72 at the intersection of Farm Lane. Farm Lane provides access to the University’s agricultural studies farm. The intersection experiences some pedestrian crossings, but is not the proper location for a full traffic signal. This location is well suited for the HAWK due to heavy traffic volumes and high speeds on the mainline and very minor side street volume. Through implementation of the above safety countermeasures as well as other safety initiatives, Delaware is working towards its goal of reducing the number and frequency of all crashes on its roadways. Questions regarding these and other safety initiatives being undertaken in Delaware can be directed to DelDOT’s Safety Programs Manager, Adam Weiser, P.E., PTOE at (302) 659-4073 or Adam.Weiser@state.de.us. In 2003, the City of St. Petersburg, Florida started an ambitious program to improve pedestrian safety as part of a comprehensive Bicycle Pedestrian Master Plan: CityTrails®. A major component of this program was crosswalk safety, which has been a nationwide concern for many years. The task was to dramatically increase motorist yielding compliance at mid-block locations, from a base rate of less than 2% and bring the pedestrian crash rate closer to the national average. St. Petersburg’s pedestrian crash rate was 68.9 per 100,000 population in 2000 compared with a State rate of 41.9 and a national rate of 23.4. Immediate action was imperative. The tool used was called the Rectangular Rapid Flashing Beacon or the “Enhancer”. 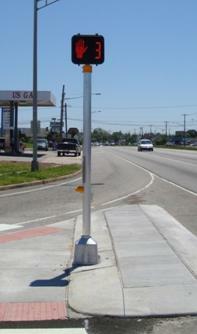 The installation of the Enhancer, which is mounted under the pedestrian crosswalk signs, was used at 18 uncontrolled crosswalks. Two-year evaluation results show an overall system wide average motorist yielding compliance rate of 82%. These results indicate that the use of the Enhancer increased motorist yielding rates significantly and has maintained these rates over time. There are clear safety benefits associated with the introduction of this pedestrian-activated device. The pedestrian crash rate continued to decline to 23.9 in 2008 and indicates that this program using the Enhancer has dramatically improved pedestrian and crosswalk safety. In the spring of 2007, Operation Teen Safe Driving was launched in rural Tazewell County after automobile crashes took 15 teen lives in 15 consecutive months. The program drastically reduced teen fatalities in Tazewell County. Based on the success in Tazewell County, the Ford Motor Company Fund teamed up with the Illinois Department of Transportation’s Division of Traffic Safety (DTS), to take this lifesaving program statewide in 2008. The Allstate Foundation joined as a partner. All 900 Illinois public and private high schools were invited to submit an application to DTS, which identifies issues relating to traffic safety in their community (i.e., underage drinking, driving unbuckled, driving impaired, driving distracted). A total of 225 schools submitted applications and the list was narrowed to 105. Each school received financial assistance, which provided the incentive to challenge students and their communities to participate. This year over 99,000 students statewide were influenced by this program. During the last three years, close to a quarter of a million students were reached. The top schools from each region were invited to send students to a “Ride and Drive” event sponsored by the Ford Motor Company Fund, where professional drivers provided critical driving skills. Over 800 students participated in Chicago and downstate events this year. In Illinois the program seems to be working with a 40% reduction in teen deaths from 2007 (155) to 2008 (93). Saving lives and making the roadways safer for everyone spells success! The Washington State Department of Transportation’s (WSDOT) coordinated and proactive roadway safety approach includes the Highway Safety Issues Group (HSIG): a team of safety experts, advocates, and executives. This approach allows decision buy-in from all agency regions and programs, allowing swift implementation of safety policy, programmatic changes, and funding. HSIG’s multi-disciplinary approach has played a vital role in Washington State bettering the national milestone with the lowest fatality rate in state history of 0.94 fatalities per 100 million vehicle miles traveled (VMT). The HSIG was instrumental in WSDOT providing greater resources and emphasis on safety by instituting centerline rumble strips, cable median barrier, and low-cost safety enhancement programs. These programs contributed to the decrease in fatal and serious injury collisions. Preliminary results of “before and after” studies on centerline rumble strips indicate a 50% reduction in fatal and serious injuries caused by cross-centerline collisions. 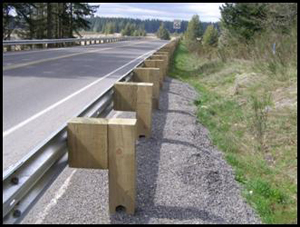 As of 2007, WSDOT had installed 177 miles of cable median barrier resulting in a 73% annual decrease of cross-median collisions. The Low-Cost Enhancement (LCE) program is designed to allow WSDOT to deliver lower-cost projects that provide immediate, sometimes interim or sometimes long-term safety improvements to the highway system. The HSIG is working with the FHWA in developing policy that moves away from a strictly standards based design to a tiered strategy to invest in substantive rather than nominal safety and offer the greatest return in terms of cumulative and annualized safety benefits. Safety is the first of the California Department of Transportation’s (Caltrans) five strategic goals. This dedication to safety has been the driving force for California’s Strategic Highway Safety Plan (SHSP), a statewide effort coordinated and led by Caltrans. To develop the SHSP, Caltrans partnered with safety stakeholders from federal, state, and local agencies, as well as private groups and individual citizens. Over 500 stakeholders provided input to develop the 16 “Challenge Areas” addressed by the SHSP. To implement the SHSP, Caltrans facilitated the data-driven analysis that identified the highest-priority safety issues and ultimately defined 152 distinct “Actions” in support of the 16 Challenge Areas. Currently, over 300 safety stakeholders representing 80 different agencies and organizations are working together to implement the Actions within the SHSP. These working relationships are delivering efficiencies and progress in safety improvements never before seen on such a large scale. The SHSP has provided a mechanism for non-governmental safety stakeholders to provide input and resources to the planning and implementation of statewide safety strategies, countermeasures, and actions. Furthermore, the SHSP has delivered significant improvements and efficiencies in communication and cooperation between State and local agencies with transportation safety related responsibilities. The SHSP has also developed an ongoing and evolving forum for continued participation and motivation of interested safety stakeholders. And finally, the SHSP team is developing a web-based performance measurement tracking tool that will be accessible to all safety stakeholders and will make reports available to the public. Cooperation is fostered because the goals of the jointly developed SHSP and implementation plan are also shared among the separate agencies and stakeholders. This inclusive approach ensures that all major stakeholders are represented in what serves as an unofficial statewide traffic safety policy committee, providing information, analysis, and expert opinions to the highest levels of State policy and legislative decision-makers. In 2008, California’s traffic fatalities decreased 13.2% (3,451 vs. 3,974), reaching their lowest level since the federal government began recording traffic fatalities in 1975. Since the passage of Safetea-Lu in 2005, FHWA has provided states with funds to implement a Highway Safety Improvement Program (HSIP), based on comprehensive Strategic Highway Safety Plans, to reduce fatalities and serious injuries. To assist states in this effort, FHWA, state DOT’s and Local Technical Assistance Program (LTAP) centers provide technical assistance as they are able, but a wealth of knowledge resides with your peers – other practitioners. The FHWA Highway Safety Peer-to-Peer (P2P) programs offer a range of technical assistance across multiple topics and sources of expertise. If you are responsible for roadways and have a question about implementing highway safety improvements or programs, you may want to start with experts in your state Department of Transportation or FHWA Division office. If however, you would like additional assistance, you may contact one of the FHWA Highway P2P Programs. Roundabout P2P Program. [Future] Will offer assistance to state DOTs in routinely considering roundabouts as viable intersection alternatives for new intersections and existing ones experiencing safety and/or operational problems. The Program will consist of state-to-state site visits, telephone and e-mail technical assistance, and other means of relaying important information to a requesting state DOT or local agency on roundabout principles in general and successful installations throughout the country. Other FHWA offices offer P2P assistance on other topics, such as Freight and ITS. an organized peer event: work session, roundtable, or dialogue. How do I contact FHWA about a P2P program? The P2P Program Coordinator will select a peer from the volunteer database who is able to answer your question and have the peer contact you directly. The FHWA Office of Safety is pleased to announce the Highway Safety Improvement Program (HSIP) Peer-to-Peer (P2P) Program, which is open to State DOT’s implementing HSIP, Strategic Highway Safety Plans (SHSPs), and related programs. The HSIP P2P Program is aimed at helping States implement the HSIP, and addressing the technical assistance needs of State and local transportation safety professionals on topics relating to HSIP: including HSIP, SHSP, High Risk Rural Roads and Railway-Highway Grade Crossing Programs. The HSIP P2P Program offers a full range of technical support – from direct answers by phone or e-mail, to on-site support, conference workshops or round-tables, and intensive Peer Exchange events. Agencies in need of technical assistance should contact the HSIP P2P Hotline at (877) 473-0953 or e-mail at hsipp2p@dot.gov. The HSIP P2P program covers only program level topics related to HSIP methods and processes. Peer exchanges may be about the HSIP project selection or evaluation processes, for example, but not about specific projects; may address use of crash information in selecting SHSP emphasis areas, but not data collection; could include updating the SHSP and revisiting emphasis areas, but not specific countermeasures and appurtenances. Of course, any request for technical assistance received will be routed to the person or program that can best provide assistance, even if it’s not eligible for the HSIP P2P set of services. Peer Exchange Event. The Peer Exchange format fosters information exchange among States in person, on-site, allowing representatives from peer States to educate one another while sharing noteworthy practices and lessons learned. This affords States an ideal opportunity to fill gaps in their HSIP or strengthen action plans and strategies for particular emphasis areas. The Peer Exchange event is the most intensive form of HSIP technical assistance offered by the P2P Program and requires a separate application. A successful Peer Exchange event is a well-planned and highly collaborative platform for the exchange of ideas among the applicant State, peer experts from visiting States, and safety stakeholders. Peer exchanges generally involve the host agency – the agency that applies for the peer exchange – and one or more agencies that have implemented successful programs addressing the gaps in the host agency’s safety plan. The Peer Exchange can result in a range of positive outcomes, from new partnerships to a list of defined and concrete actions that a State can implement to enhance its HSIP. 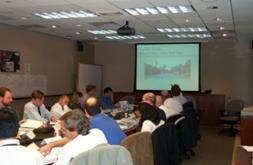 Results from pilot Peer Exchange events can be found on the HSIP P2P Website: http://safety.fhwa.dot.gov/p2p/. Note: The priority for the intensive Peer Exchanges in FY11 will be given to applications that address the implementation of the State HSIP or updates to their State SHSP, and especially applications that describe how the peer exchange method of knowledge exchange can best assist the agency in strengthening its road safety practices. We do require that those interested in a Peer Exchange event should discuss their ideas with their FHWA Division Office. Applications for FY11 may be submitted after July 1, 2010, and those applicants that demonstrate strong commitment by agency leadership for the peer event, and a strong HSIP technical assistance need on the application, will be the most likely candidates for peer exchange support. The application is available online at: http://rspcb.safety.fhwa.dot.gov/peer_event_app.asp. For more information about these programs, please contact Ben Gribbon, at (202) 366-1809 or at Benjamin.Gribbon@dot.gov. The Federal Highway Administration has launched the Local and Rural Road Safety Peer-to-Peer (LRR Safety P2P) Program. FHWA established this new program as a form of technical assistance for local and rural highway agencies to resolve safety problems on the roads they maintain. The first step in initiating this free resource is contacting the P2P coordinator. This can be done by phone, P2P Hotline (866) P2P-FHWA, fax (877) 663-2233 or e-mail SafetyP2P@dot.gov. The coordinator will analyze specific needs and determine the best peer based on those needs. In an effort to raise the profile of roundabouts - one of the 9 Proven Crash Countermeasures -the FHWA joined with theConnecticut Department of Transportation and members of the Institute of Transportation Engineers (ITE) Roundabouts Task Forceto hold a Roundabouts Peer Exchange July 7-8 in Hartford, Connecticut. The states of Connecticut, Maine, Massachusetts, New Hampshire, New Jersey, New York, Pennsylvania, Rhode Island and Vermont were represented. This effort involved the FHWA Headquarters (HQ) Intersection Team, FHWA Resource Center Safety & Design TST and nine FHWA Division Offices, with funding provided by multiple sources: HQ Intersection Program funds, Resource Center Technology Deployment funds, and Accelerating Safety Activities Program (ASAP) funds. This funding arrangement allowed for travel support for key focus State DOT and Division participants to attend as well as for a contractor (ITE) to be used to coordinate event and travel logistics. The goal of the Roundabouts Peer Exchange was simple: to save more lives by accelerating implementation of roundabout intersections in the Northeast U.S. through sharing, educating and networking. Over 80 attendees listened to presentations by the target State DOTs and invited subject matter experts from around the United States. The Peer Exchange began with each State giving a State of Roundabouts presentation, highlighting important lessons learned and successes over the last 10 years since the original FHWA Roundabouts Guide was published. The State DOT presentations also provided a glimpse into the future for roundabouts in the Northeast, suggesting that roundabouts will be seen in ever greater numbers in coming years. In fact, as part of their reports, the States provided estimates on the numbers of roundabouts built and under study. Based on these estimates, on State-owned roads in these 9 states, there are approximately 98 roundabouts currently in operation (half of which are in New York) and another 74 under study. It was further estimated that there are another 100+ roundabouts currently in operation at locally-owned intersections. Following the “State of Roundabouts” presentations, a series of technical topics were presented, followed by Q&A opportunities and networking breaks. The technical topics covered included marketing and education, pedestrian accommodation and accessibility, signing and marking aspects, capacity analysis techniques, planning and design considerations, and retrofitting existing non-conforming rotaries/circles. The Exchange ended with a close-out session that encouraged attendees to develop action items designed to accelerate roundabout implementation in their respective jurisdictions. 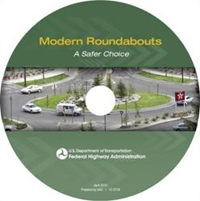 Action items included considering construction of a mini-roundabout and making wide distribution of the new FHWA video Modern Roundabouts: A Safer Choice. In addition to multiple FHWA contributors, the event was supported by the Connecticut Department of Transportation, which provided the facility, and members of the ITE Roundabouts Task Force, who donated time and energy in planning and contributing technical expertise to the event. A summary presentation of the Peer Exchange was given at the July 15 Office of Safety Web conference and is available on the safety Website. More information about this event can be obtained by contacting Jeff Shaw (708.283.3524 or jeffrey.shaw@dot.gov) or Hillary Isebrands (720.963.3222 or hillary.isebrands@dot.gov). A new video that explains the many benefits of roundabout intersections is now available. It is intended for decision makers at state and local transportation agencies to overcome the common barriers and reasons for not considering roundabouts as intersection alternatives. It is presented in a non-technical manner and can be used at public meetings for proposed roundabout projects. The video covers such things as: roundabout features and principles; applicability to all roadway types, including state highways and at interchange ramp termini; accommodation of pedestrians, large trucks and emergency vehicles; and acceptance by the public, including older drivers. It discusses the safety, operational, environmental, and aesthetic benefits of roundabouts. Transportation agencies are encouraged to consider roundabouts as viable alternatives to traditional signalized and stop-controlled intersections for all new intersections and for existing ones experiencing safety and/or operational problems. The video is also on the safety Website at http://safety.fhwa.dot.gov/intersection/roundabouts/, and hard copies will be available from the Report Center in the near future. If you have any questions or need additional information, please contact either Jeff Shaw at jeffrey.shaw@dot.gov (708-283-3534) or Ed Rice at ed.rice@dot.gov (202-366-9064). The Intersection Safety Program announced the availability of a new technical summary document titled Roundabouts (Report FHWA-SA-10-006) that has been prepared for the Office of Safety. A copy of this report and the summary, plus an accompanying slide presentation is available on our Website at http://safety.fhwa.dot.gov/intersection/roundabouts/. These materials provide a reference for Federal, state, local and other transportation professionals who are involved in the selection, design, and implementation of modern single-lane and multi-lane roundabouts. This technical summary explores the characteristics of modern roundabouts while reinforcing the need to apply a principles-based approach to design. It presents an overview of the key considerations for planning, analysis and design of roundabouts in urban, suburban and rural environments. In addition to a discussion on roundabout characteristics, the document contains sections on the benefits of roundabouts, user considerations, location considerations, operational analysis, design considerations, and costs. This information can be used by a wide range of transportation managers, decision makers and practitioners in making informed decisions on the inclusion of roundabouts as intersection alternatives. Roundabouts are included as one of FHWA’s Proven Safety Countermeasures as defined and described in a July 10, 2008, memorandum (see http://safety.fhwa.dot.gov/policy/memo071008/). Hard copies of the technical summary are presently being printed. For further information, please contact Ed Rice, FHWA Intersection Team Leader, at (202) 366-9064, or at ed.rice@dot.gov. The Intersection Safety Program announced the availability of a new technical summary document titled Mini-Roundabouts (Report FHWA-SA-10-007) that has been prepared for the Office of Safety. A copy of this report and the summary, plus an accompanying slide presentation is available on our Website at http://safety.fhwa.dot.gov/intersection/roundabouts/. These materials provide a reference for Federal, state, local and other transportation professionals who are involved in the selection, design, and implementation of mini-roundabout intersections. Because experience with mini-roundabouts is limited in the United States, the information presented draws primarily upon guidance and experience from other countries, with reference to American guidance as appropriate. This technical summary explores the unique characteristics of mini-roundabouts while reinforcing the need to apply a principles-based approach common to all roundabout design. It provides an overview of the key considerations for planning, analysis and design of single-lane mini-roundabouts. In addition to a discussion on characteristics, the document contains sections on the benefits of mini-roundabouts, user considerations, location considerations, operational analysis, design considerations, and costs. The document can be used by a wide range of transportation managers, decision makers and practitioners in making informed decisions on the inclusion of mini-roundabouts as intersection alternatives where appropriate. It is noted that roundabouts are included as one of FHWA’s Proven Safety Countermeasures as defined and described in a July 10, 2008 memorandum (see http://safety.fhwa.dot.gov/policy/memo071008/). The Intersection Safety Program announced the availability on the safety Website at http://safety.fhwa.dot.gov/intersection/resources/ of four documents describing the technical assistance process that is being provided to state DOTs by our office for the development of statewide Intersection Safety Implementation Plans (ISIPs). Since early 2007, the Office of Safety has been offering technical assistance to states in the development of ISIPs (formerly called “Action” Plans), which are the implementation vehicles for the intersection components of the states’ Strategic Highway Safety Plans (SHSPs). Beginning with the Intersection Focus States and then the Opportunity States, 10 states have so far been afforded this technical assistance with several more planned in FY 2010. The assistance is provided by a team from the contractor, the Resource Center, and our office. These documents provide the steps and information needed for a state to develop its own ISIP using some or all of the processes described, without our formal technical assistance. The target audiences for this material are primarily state DOT traffic and safety managers and administrators responsible for implementing the intersection component of their SHSPs, but the process could also be used by local transportation agencies. For further information, please contact Ed Rice, FHWA Intersection Team Leader, at (202) 366-9064, or at ed.rice@dot.gov. The Intersection Safety Program announced the availability of a new technical summary document titled Access Management in the Vicinity of Intersections (Report FHWA-SA-10-002) that has been prepared for the Office of Safety. This report and the summary, plus an accompanying slide presentation are available on our Website at http://safety.fhwa.dot.gov/intersection/resources/. These materials provide an easy reference for Federal, state, local and other transportation professionals who are involved in the selection, design, and implementation of access management near traditional signalized and stop-controlled intersections. 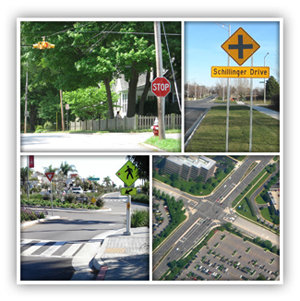 They provide an overview of safety considerations in the design, implementation and management of driveways and other access points near traditional intersections in urban, suburban, and rural environments where design considerations can vary as a function of land uses, travel speeds, traffic volumes by mode, and many other variables. The information in the report can assist a wide range of transportation managers, decision makers and practitioners in making informed decisions on access management in and around intersections. Hard copies of the technical summary are currently being printed. The fourth version of the FHWA Comprehensive Intersection Resource Library CD (FHWA-SA-09-027), originally developed in 2002 and updated in 2004, is now available. It contains intersection safety-related resources that represent a broad cross section of publications, educational materials, and other media published by the Federal Highway Administration and other transportation safety partners. Material searches can be made by keyword, title, author or topic. The video is targeted primarily to working level engineers and related practitioners in their efforts to improve intersection safety. It can be used by transportation professionals at all levels including engineers, planners, safety managers, policy makers, law enforcement and others as easy references to pertinent intersection safety materials. The CD focuses mainly on engineering materials, but also includes associated information on law enforcement, education and emergency response treatments and programs. Beyond an initial section of background information, the library content is organized into five broad categories including traditional signalized and unsignalized intersections, roundabouts, highway-rail grade crossings, and alternative intersection designs such as the Displaced Left Turn Intersection and Median U-Turn Intersection. A final section provides links to other transportation safety partner Websites for additional information. This CD will soon be available on the FHWA Website at /intersection/resources/fhwasa09027/. A limited number of hard copies are also presently available. For further information, please contact Ed Rice, FHWA Intersection Team Leader, at (202) 366-9064, or at ed.rice@dot.gov. A guidance memo on the recommended height of 31” for new guardrail installations was issued on May 17. Recent research on standard 27” guardrail has shown that it does not meet current Test Level criteria. A subsequent memo by the Roadway Departure Team will address existing guardrail, after close coordination and work with AASHTO’s Technical Committee on Roadside Safety, which meets in September. On April 22, 2010, a standard for maintaining minimum Retroreflectivity of longitudinal pavement markings was published as a notice of proposed rulemaking in the Federal Register. Visit http://edocket.access.gpo.gov/2010/2010-9294.htm. The docket number for this rulemaking is “FWHA-2009-0139”. Entering that number in the www.regulations.gov “Keyword or ID” search box and leaving the “Select Document Type” box empty should lead those who wish to participate in the rulemaking process to the public docket, where comments submitted thus far can be seen and comments can be entered. Comments must be received on or before August 20, 2010. The proposed revisions would amend the Manual on Uniform Traffic Control Devices (MUTCD) and establish a uniform minimum level of nighttime pavement marking performance based on the visibility needs of nighttime drivers. Learn new highway safety procedures, technologies, and information to enhance your HSIP efforts. This course covers topics ranging from core safety concepts to detailed discussions of technical methods for data-driven safety planning. The course is geared toward new and veteran state and local transportation professionals in the areas of data collection and analysis, safety management processes, and planning and project management. Introduce yourself to various non-traditional intersection concepts, which could improve highway safety and mobility compared to that of conventional at-grade intersections and grade-separated interchanges. This course will explore the innovative treatments engineers are currently investigating and implementing in the field. The target audience includes Federal, State, and local transportation traffic and safety engineers and planners involved in improving the performance of intersections. Gain the tools necessary to implement innovations quickly and successfully, and then learn how to incorporate the innovations into an agency’s standard practice. This course discusses the features of successful implementations, provides information on the components of an implementation plan, lists resources for locating innovations and funding for implementation, and discusses strategies for neutralizing challenges to implementing innovations. The course is delivered in two parts. First, participants attend a two-hour Web conference as an introduction to the course. One to two weeks following the Web conference, participants attend two days of classroom training to complete the course. For full course descriptions, please visit the NHI Website at www.nhi.fhwa.dot.gov. For more information and to schedule a session, please contact the NHI Training Team at (703) 235-0534 or nhitraining@dot.gov. Under the direction of Deputy Administrator Greg Nadeau, Associate Administrator of Research & Technology, Michael Trentacoste, and Director of Technical Services, Amy Lucero, innovation deployment teams held planning retreats during March and early April 2010 to develop draft implementation plans that address each technology and their potential benefits. Performance measures, goals and outcomes, methods for evaluation, a deployment schedule and strategies, marketing and communication plans, and a proposed budget were incorporated into the detailed deployment plans. These plans will be finalized in the next few months by multidisciplinary innovation deployment teams including participants from headquarters, field offices, States and key stakeholders. In coordination with States, industry, and other key stakeholders these plans will used to mainstream the technologies in an effort to make them standard practices where appropriate and to evaluate the benefits derived through their implementation. Accelerating these innovative technologies as a component of the EDC initiative will provide an opportunity to build FHWA's capacity, in concert with its stakeholders, to identify best practices and address some of the most challenging highway issues facing the Nation. For more information, contact Bob Richard at bob.richard@dot.gov or (202) 493-3163. Motor vehicle crashes on the Nation's roadways extract a high toll on American productivity and quality of life. Highway and traffic engineers have been in pursuit of relatively low-cost safety improvements that might have the potential to reduce crashes, save lives, reduce injuries, and lower property damage. For many rural areas, low-cost safety treatments are the only affordable option. This report describes a driving simulator experiment designed to evaluate two sets of alternative low-cost safety improvements for rural areas. For more information, contact Roya Amjadi at roya.amjadi@dot.gov or (202) 493-3383 or visit https://www.fhwa.dot.gov/publications/research/safety/09061/. This report covers four intersection and two interchange designs that offer substantial advantages over conventional at-grade intersections and grade-separated diamond interchanges. It also provides information on each alternative treatment covering salient geometric design features, operational and safety issues, access management, costs, construction sequencing, environmental benefits, and applicability. For more information, visit https://www.fhwa.dot.gov/publications/research/safety/09060/. The alternative intersections selection tool can be used for traffic analysis planning of selected types of alternative intersection designs using hourly traffic counts by movements. The innovative intersections are mostly described in the Alternative Intersections/Interchanges: Informational Report (see above). Intersections are evaluated using the method of critical lane volume summation to provide planning capacity assessment at each crossing. The entire AIST has been developed in Microsoft® Excel and basic knowledge of Excel is necessary to use it. The tool is an Excel workbook with many spreadsheets displaying the different types of intersection design. For more information and a free copy of this AIST tool, contact Joe Bared joe.bared@dot.gov or (202) 493-3314 or Wei Zhang wei.zhang@dot.gov or (202) 493-3317. The FHWA Office of Safety recently published the Highway Safety Improvement Program (HSIP) Manual (FHWA-SA-09-029). The HSIP Manual updates the 1981 HSIP User's Manual to reflect current law, regulations and new and emerging technologies and noteworthy practices regarding state and local highway safety improvement programs and related activities. The HSIP Manual provides an overview of the HSIP and outlines procedures and tools to assist transportation professionals with the planning, implementation and evaluation phases of the HSIP. The HSIP Manual is available online at: http://safety.fhwa.dot.gov/hsip/resources/. Copies may be requested from the FHWA Report Center at: report.center@dot.gov. Under Section 1907 of the SAFETEA-LU, the U.S. Congress directed the Secretary of Transportation to conduct demonstration projects in Alaska and Tennessee. The demonstration projects are to study the safety impacts, environmental impacts, and cost effectiveness of different pavement marking systems and the effect of State bidding and procurement processes on the quality of pavement marking material employed in highway projects. For more information visit, https://www.fhwa.dot.gov/publications/research/safety/09039/ or contact: Carl Andersen, 202-493-3366, carl.andersen@dot.gov. The overall goal of FHWA's Speed Management Strategic Initiative and the FHWA Speed Management Program is to improve the safety of the Nation's highways through the reduction of speeding and speed-related (SR) crashes. This report summarizes a detailed examination of crash data and the development of an SR crash typology. For more information visit, https://www.fhwa.dot.gov/publications/research/safety/10024/ or contact: Richard Knoblauch, 202-493-3369, richard.knoblauch@dot.gov. The use of three-lane roundabouts raises the concern that low comprehension and compliance could be a bigger problem than at two-lane roundabouts for the following reasons: (1) the larger radii of three-lane roundabouts enable higher speeds, (2) angles of impact in three-lane roundabouts may be more severe when errant vehicles stray across multiple lanes from their assigned lane, and (3) traffic volumes will be higher, and thus, more vehicles will be affected by incidents. The present study is intended to address this concern of low comprehension and compliance. For more information visit, https://www.fhwa.dot.gov/publications/research/safety/10030/ or contact: Joe Bared, 202-493-3314, joe.bared@dot.gov. The Segway™ Human Transporter (Segway HT) is one of several low-speed transportation devices (e.g., bikes, scooters, wheelchairs) that, under certain circumstances, travels on sidewalks, roadways, and other shared-use paths. The objective of this research was to examine the primary operating characteristics of the Segway HT. For more information visit, https://www.fhwa.dot.gov/publications/research/safety/10025/ or contact: Chris Monk, 202-493-3365, chris.monk@dot.gov. This Highway Safety Information System summary replaces an earlier one, Evaluation of Lane Reduction "Road Diet" Measures and Their Effects on Crashes and Injuries (FHWA-HRT-04-082), describing an evaluation of "road diet" treatments in Washington and California cities. This summary reexamines those data using more advanced study techniques and adds an analysis of road diet sites in smaller urban communities in Iowa. For more information visit, https://www.fhwa.dot.gov/publications/research/safety/10053/ or contact: Carol Tan, 202-493-3315, carol.tan@dot.gov.